← We Interupt This Marriage to Bring You Hunting Season..
Not long ago, while “visiting” with my mother-in-law (you know, “visiting,” as in sitting in the “front room” on the “sofa” and talking; something I recalled my grandparents doing with friends when I was young) the conversation turned to elementary school education and my great-niece. Yes, I shudder, I have a “great-niece,” but then, I remind myself that this is still a generation away from a “great-grandchild.” Whew, thank goodness, I’m still getting used to the idea that I am someone’s grandma! Anyway, my mother-in-law was telling me that there was discussion that, at my great-niece’s elementary school, they were considering doing away with teaching cursive handwriting or, as my mother-in-law called it, “penmanship.” My poor mother-in-law was so distraught over this! She just shook her head and wondered what this world was coming to. A phrase like “going to hell in a hand-basket” (whatever that really means) seemed to have hung, unspoken, in the air. Part of me completely understood this choice; in today’s world, teaching keyboarding skills before cursive handwriting seems to make sense. But the other, nostalgic part of me, which seems to pipe up more and more lately, was a little sad about the slow extinction of the hand-written correspondence. For someone like my mother-in-law, this is beyond comprehension. How will these young people learn to perfect their handwriting so that when they write a letter to their grandmother, it will be legible? For, you see, beyond the face to face “visits,” and the Sunday afternoon phone calls, the hand-written correspondence is the form of correspondence that my mother-in-law relies upon. She depends upon it to keep up with the family members comings and goings, deaths and births, weather and price per pound of cattle at last week’s auction. Over the decades, while she waited for my father-in-law to finish a meeting, check on the cattle, or merely wake from his nap, she would be sitting down to “write a letter” to one of us. I remember from my own elementary school days, the excitement of third grade. Third grade was when we would learn cursive writing! We would finally be able to graduate from pencil to pen! I loved how the blue Bic pen would roll over the “newsprint” style of paper. I would practice for hours making sure my swirls and loops were just right, trying my “hand” at my own style and developing a signature that was uniquely my own. Once this was mastered, I would practice my new skills on beautiful un-lined stationery, trying very hard not to have the written lines slope either too far up nor too far down on the page. I remember writing letters to my friends who had moved away, to my step-sister who was “away” at college (going from Los Angeles to San Diego), and to my grandparents. I’d send postcards to friends at home (again, Los Angeles area) from a vacation that we took up to Lake Arrowhead; arriving home before the postcard did. 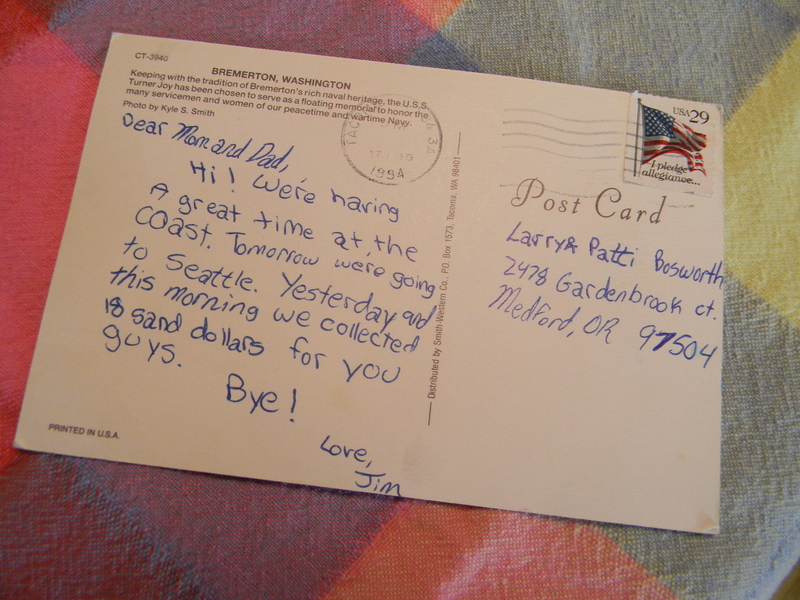 Apparently, I passed along my postcard writing skills. This one is dated 1994. And, being the “rebel rouser” that I was, there was also the often passed handwritten notes in class. In high school, I acquired a typewriter which I started using periodically for some written assignments. But, I still preferred the handwritten form of documentation. It served me well until, finally in college, written assignments were required to be typed. 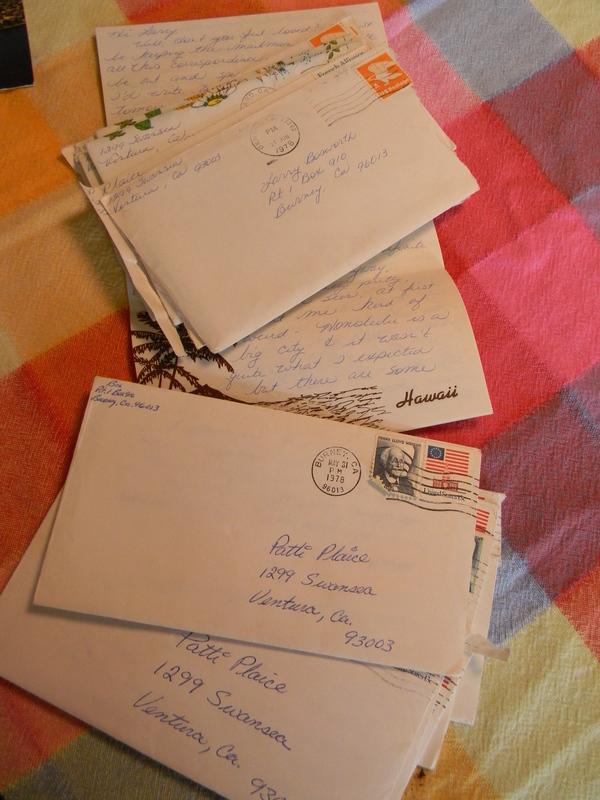 However, I continued to rely on the handwritten correspondence to share my thoughts. In his nightstand, my sweet husband keeps a little bundle of letters written by me to him the summer before our final year in college, he was in Northern California, I was in Southern California. And, as proof that he is his mother’s son, in my nightstand is a similar bundle of letters I received from him that same summer. These are precious little windows into the early days of our life together. 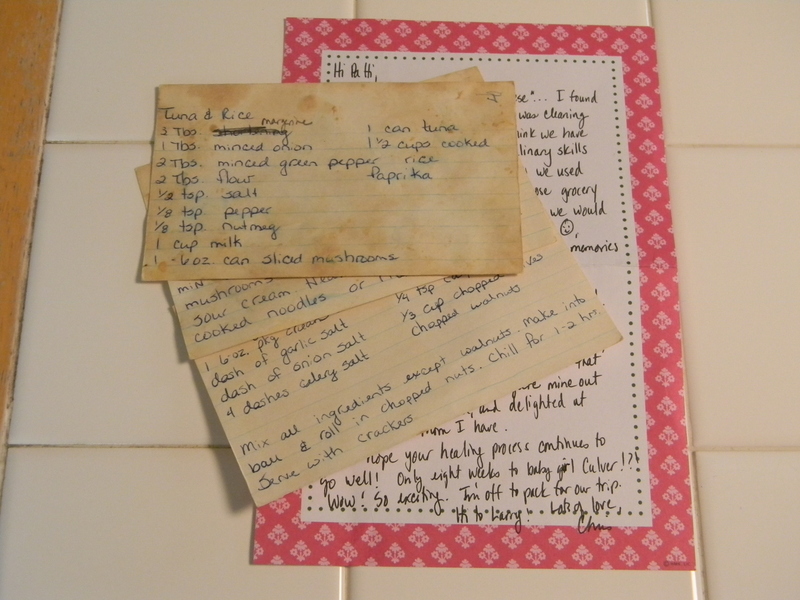 Recently, one of my college roommates sent me a “blast from the past.” Along with her sweet handwritten note, she had enclosed these, recipe cards she had found that had been part of our college collection back when we were struggling students, short on funds and culinary skills. Somehow, when I held these yellowed cards, they conveyed feelings of nostalgia that a link to Epicurious.com never could. And, thanks to today’s technology, my daughter and I, even being 3,000 miles apart, are able to correspond, sometimes multiple times a day, either via cell phone, texting or email. However, the prized placeholders on our refrigerator door are her most recent handwritten notes of greeting or thanks. So, what will happen to the hand-written correspondence? Other than learning to develop your signature, will it really die a slow death? Well, not if my mother-in-law (or I) has anything to do with it. Somehow just as she attempts to pass along the skills of crocheting onto her female grandchildren and great grandchildren, I can also see her pulling out a pad of lined “newsprint” paper and nice flowing ball point pens in order to teach them the art of cursive handwriting. Hmmm, not a bad idea. Perhaps I should go stock up on cursive handwriting teaching supplies soon, before they become extinct, so that I can sit down with my grandson and, later, BGC, and teach them a lost art; the art of conveying your feelings through the way the letters swirl and loop across the page, lines never slanting too far up, nor too far down. This entry was posted in Family, Rants, Uncategorized and tagged nostalgia, technology. Bookmark the permalink. When we think back to when we started to learn to write (and then in cursive! ), all we knew was paper letters or what’s now known as snail mail. That’s it….paper. Then typewriters, once only afforded by businesses, came into homes because they became cheaper. Typing correspondence was ‘the thing to do’. And now? What would we do without the internet and instantaneous communication? (And let’s not forget to throw in Skype either!) Good post, Fannie! I am one who also enjoys handwritten correspondence and the memories they evoke. I have a large file that contains many of the letter I received from my Dad, who was a prolific letter writer! I also love it when I come across a note he made in handwriting next to a recipe, with his signature exclaimation mark! I even have a picture of the front page of one of his favorite books, (which for the life of me I was unable to digest) which stated to return the book to: address label including his info, and underneath that, a handwritten, “or else!”. Loved the post, Fannie!